Discussion in 'Luxury and Lifestyle' started by dealmaker, Apr 9, 2019. Minnesota College Has a Portrait by ‘The Scream’ Painter—Or It Doesn’t. Experts Won’t Say. An untitled portrait of violinist Eva Mudocci, possibly by Edvard Munch, held by Flaten Art Museum Director Jane Becker Nelson. SARAH HANSEN FOR FLATEN ART MUSEUM AT ST. OLAF COLLEGE. Officials at a small Midwestern college rejoiced when they learned the school owned what appeared to be an oil painting by Edvard Munch. Now they’d be excused if they wanted to scream. Nearly seven years after Munch’s iconic portrait of a ghoulish man, “The Scream,” sold to New York financier Leon Black for $120 million, St. Olaf College in Northfield, Minn., said it has uncovered fresh evidence that it owns an unfinished portrait by Norway’s angsty, modern master. Some of the world’s Munch experts are intrigued and want to know more. The problem is, the school can’t get the time of day from the art experts who make the final call on what’s a Munch. A researcher has unearthed a trove of documents that fill gaps in the painting’s ownership history and point to Munch as its creator. St. Olaf has also hired a firm of art-analyzing chemists who said the canvas’s pigments match the paints he used. New forensic techniques may make it easier to puzzle out a painting’s past, but the sleuths who seek to upgrade artworks are increasingly butting heads with museums who no longer want to vouch for prospects. Wary of lawsuits that could be filed by unhappy people owning rejects as well as voracious buyers eager to drive up prices for rediscoveries, museums and scholars say they can’t afford to dole out certificates of authentication—leaving hundreds of potential finds adrift. Estates for newer artists such as Andy Warhol and Jean-Michel Basquiat no longer look at contenders, citing a proliferation of fakes. Even peer-to-peer efforts require patience: It took more than 30 years for the Wadsworth Atheneum in Hartford, Conn., to have its “Vase with Poppies” authenticated as a work by Vincent van Gogh from Amsterdam’s Van Gogh Museum. The ruling came down last month. What would you need to be convinced a painting was authentic? Join the conversation below. 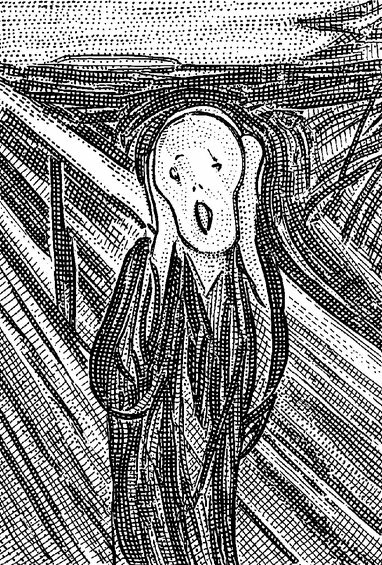 Munch Museum officials told The Wall Street Journal that the museum is aware of the work but can’t dig any deeper into the new findings in part because its curators are swamped preparing to move into a new building next spring. “Unfortunately the Munch Museum does not have the opportunity to authenticate artworks,” a spokeswoman said. Munch, who lived from 1863 to 1944, created close to 1,800 paintings over his career. About 60% belong to the Munch Museum, so the unearthing of a previously unknown work would be deemed a major coup for the art world. Reinhold Heller, a Munch historian at the University of Chicago, said he has only authenticated one new addition to the artist’s painting oeuvre since the 1960s, making St. Olaf’s candidate “temptingly rare.” Mr. Heller is planning to view the painting in person later this week, and his verdict could sway the world’s opinion. But everything hinges on securing an authentication from the Munch Museum, in part because officials there are responsible for compiling and maintaining the official catalog of Munch’s complete works. At stake is an unfinished portrait of a brunette standing regally in a billowy black dress on a berry-color carpet. Her eyes are downcast, her arms folded the same way Leonardo da Vinci painted his “Mona Lisa.” The college claims the figure is Eva Mudocci, a British bohemian violinist who was romantically linked to Munch in the early 1900s yet spent most of her life in a relationship with her accompanist, Bella Edwards. Curators say the artist tried but failed to woo her away. The back story adds to the artwork’s appeal. Just as collectors pay premiums for Pablo Picasso’s portraits of his mistresses, Munch buyers prize images of his unrequited loves or that embody his telltale melancholy. Aside from “The Scream,” which exists in several versions, few of his works have ever attained trophy levels—$6 million is the going rate for most of his paintings. Prints fetch even less, though the three lithograph designs he made featuring Ms. Mudocci remain popular. A collector paid around $288,000 five years ago for a print showing her wearing an oversize brooch. Until now, no one thought the artist had ever made a painting of her. The mystery has put St. Olaf, founded by Norwegian immigrants in 1874, in a bind. The bequest under which it received the painting in 1999 bars its sale, so it isn’t seeking to resell the work. The work’s status raises questions about how to insure and show the portrait. The college has taken it off the dining-room wall of the college president’s house, where it had hung for years. Mr. Lehmann said the school is mulling a higher-security way to exhibit it in the Flaten, the museum on campus. If confirmed, the would-be Munch would be “far and away” the most valuable piece in the school’s 4,000-piece art collection, he said. Ms. Shore uncovered letters written by Munch confirming he was seeing Ms. Mudocci in Berlin during the winter of 1903-04 and that he intended to paint her. Ms. Shore then found a letter written to the artist by one of his biggest collectors in February 1904 asking how Munch was progressing on a painting of a female violinist. The artist and Ms. Mudocci later quarreled and split abruptly. Ms. Mudocci’s granddaughter told the researcher and the college that the violinist hung a half-finished, standing portrait of herself in her Paris and London apartment until her death, and that the family believed the portrait was by Munch. After Ms. Mudocci died, another newly found record shows the painting—then titled “Lady in a Black Dress”—filtered into the Copenhagen estate sale of a close friend of Ms. Mudocci, where a small-time dealer named Poul Rée won it for about $60 in 1959. A month later, the world’s most prominent Munch dealer at the time, Harald Holst Halvorsen, wrote to the winning bidder, congratulating Mr. Rée on the find and offering to authenticate the work. Mr. Rée declined the offer because he didn’t want to split any resale proceeds, Ms. Shore said, and later sold it for $10,000 to the St. Olaf alumnus, Richard Tetlie, who left it to the college. After seeing the new research last year, St. Olaf decided to follow up on its own by hiring Scientific Analysis of Fine Art LLC to examine the painting. Jennifer Mass, a chemist and the firm’s president, used scalpels more commonly used for eye surgeries to take microscopic samples and compare them to paints Munch was known to use in the early 1900s. The Munch Museum suggested to the Journal that the new data be shown to Blomqvist, an Oslo auction house that specializes in Munch’s work. After taking a look at the materials, a spokesman said the letter from the Munch dealer, Mr. Halvorsen, would be more compelling had he mentioned the painting by name or described it in detail. As is, “it’s difficult to use that letter to strengthen the provenance,” the spokesman said. Other museums have taken the painting seriously. In 1967, Mr. Tetlie lent it to the Los Angeles County Museum of Art, which displayed it for a decade as a Munch work. The museum offered to buy the painting for $250,000 in 1971, according to Ms. Shore’s research, but Mr. Tetlie didn’t want to sell it. Mr. Heller, the Chicago art historian, said the artist himself could have solved the riddle with a few brush strokes. “If only he’d painted her holding a violin,” he said.